Shapiro, a University of California at Santa Cruz paleogenomics researcher and "enthusiastic realist," lays out a well-articulated argument for the "resurrection of ecological interactions" as the most appropriate goal of de-extinction research. She shows that programs with potential practical applications such as George Church's efforts to introduce the mammoth genes for "luxurious" hair and cold-resistant hemoglobin into an African elephant, in preparation for introducing a quasi-mammoth into Arctic habitat make more sense than trying to clone dinosaurs or dodos in order to assuage human guilt or indulge curiosity about seeing long-dead animals. Just as importantly, Shapiro strikes a blow for scientific literacy. 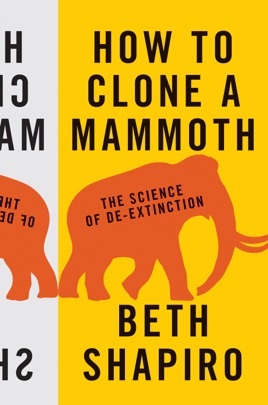 Her professorial voice shines in her thoughtful roadmap for practical decision making in theory-heavy science, as well as in her efforts to "separate the science of de-extinction from the science fiction of de-extinction." To this end, she addresses ethical considerations and explains the current state of bioengineering technologies, including DNA recovery from ancient samples, polymerase chain reactions, genome reconstruction, somatic cell nuclear transfer, and germ cell nuclear transfer. Lay readers will emerge with the ability to think more deeply about the facts of de-extinction and cloning at a time when hyperbolic and emotionally manipulative claims about such scientific breakthroughs are all too common. Illus.